Today is the premiere of the third season of the wildly popular Game of Thrones series on HBO. I’m a big fan of the show, but I haven’t read the books yet, which is practically heresy for someone aspiring to write fantasy. As penance, this post is about the map of the continent of Westeros, where most of the action takes place in Game of Thrones. For those who don’t know the series, it’s basically about various factions competing to claim the throne of the Seven Kingdoms, which is at King’s Landing. There are several regions, each ruled by a different leader from a different political house. We start the series following the Starks of Winterfell, but the series shifts to various protagonists, most of which are both good and bad. The morally ambiguous main characters make for a very compelling story. Let’s go to the map! This is just one of dozens of maps which were created by fans of the series, and I like it because it shows the political boundaries very clearly. This map functions perfectly for the fantasy genre. When you look at it, you want to know more about these kingdoms, these cities, and the people who live there. It looks like a world in conflict, with so many kingdoms sharing borders and vying for power. Each kingdom has its own symbol and therefore its own character. In the North is the Wall, and beyond that the land disappears off the map. What’s up there? They don’t know for sure (at least they don’t by the end of the second book/season). The map reflects the knowledge of the people who live there, so we as readers/viewers are in the same position as the people in Westeros, limited by the current technology in mapping and understanding the world. This map is fitting for a book named Game of Thrones. It looks like the perfect place to set a Role Playing Game between different factions battling for control of the continent. Or even a board game, where players’ armies occupy spots on the map. Is there a Game of Thrones board game already? Maps facilitate war. On a map, cities are just circles, like a space on a board game which your piece could move onto with the roll of a dice. A road connects your city to a foreign target, leading your army straight there, stripped of all obstacles which might exist in real life. On a map, a city changing hands from one kingdom to another just means erasing one name and writing another underneath it. Unfortunately, maps ignore the realities of human suffering which go along with the changes in political boundaries. There’s a disconnect between planning a battle in the comfort of one’s map room and actually waging that battle on the ground. In my book, two kingdoms are at war and the cartographer of Tinggo has drafted battle maps to assist the army. The main difference is that the cartographer is also going to the front lines. For him, war will not be just an abstract movement of troops across a map, but an actual struggle between individual soldiers out for each other’s blood. If we did that in our own world, war planners might think more carefully before pointing to a spot on the globe and ordering an attack. As for the fantasy genre, for the sake of our entertainment, I hope they never give up their warlike ways. The key to starting a writing project is not motivation. It’s not inspiration or even getting in “the right mood”. The key is actually sitting down and putting words on paper (or in a Word doc). For a long time, I wanted to write fiction but I never did. I was busy, tired, scatterbrained, and generally unmotivated. The problem was I didn’t feel like sitting down and typing words, especially after a long day of studying or working. But the even bigger problem was that I believed, subconsciously, that I needed to be in the right state of mind before I started writing. Then I realized something: if you wait to feel motivated, inspired, and well-rested, you’ll never actually start writing. 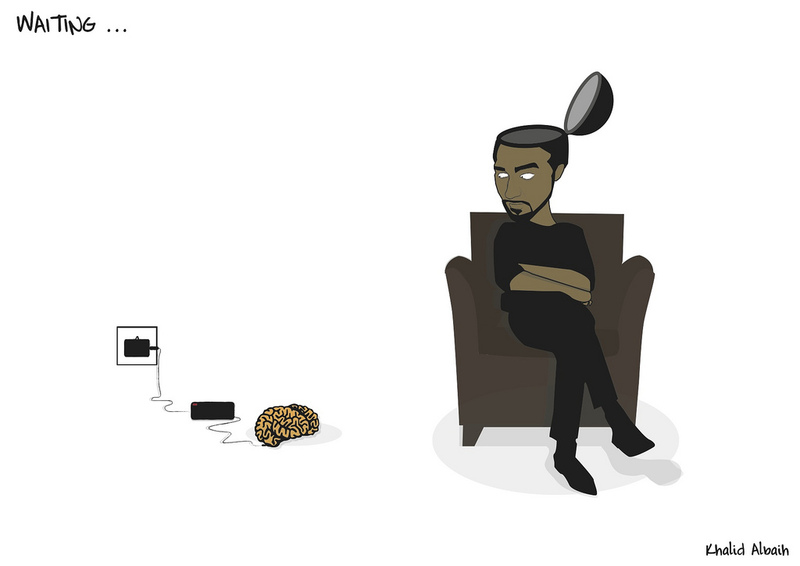 If you wait for your brain to fully recharge, you may never begin. I learned this lesson while reading a very insightful book, “The Antidote: Happiness for People Who Can’t Stand Positive Thinking”, by Oliver Berkeman. Burkeman’s central thesis is that the message from mainstream positive thinking culture, that all we need to achieve success is to imagine it and eliminate “impossible” from our vocabulary, is horribly flawed. In contrasting this viewpoint with Buddhism, Burkeman argues that mainstream motivational advice overemphasizes attachment to a certain emotional state before one can take action. This actually makes it harder to take action. If you’re trying to write a book, and believe you need to feel really fired up in order to begin, then you’re just creating extra hurdles for yourself. Burkeman points out that “the daily rituals and working routines of prolific authors and artists – people who really do get a lot done – very rarely include techniques for ‘getting motivated’ or ‘feeling inspired.’” I love this quote. This is something to hang up on your wall every time you feel like your mood just isn’t right for writing tonight. Then Burkeman explains what successful writers, like Anthony Trollope, Charles Darwin, and John Grisham, actually do to finish their novels. They set routines for themselves and they keep them. For example: Write for 1, 2, or 3 hours a day, every day, without exceptions. Even if they’re not “feeling it”, they still do it. This also reminds me of the old adage that a flame that burns brighter burns out quicker. A sudden burst of inspiration may motivate you to write on a given day, but it won’t necessarily carry you through to the conclusion of the novel. Writing takes patience, stamina, and determination- like a flame on a burner set to the lowest setting. So, after I read Burkeman’s book, I sat down one night and started writing. I didn’t know what I was going to write about, but I had a general idea for a story in my head. It was painful at first, but I wrote a few paragraphs. The next day, I read it again, scrapped it all, and started over. But that first exercise was not a waste. It had gotten the gears turning in my head and suddenly my mind was overflowing with ideas about the story. Since then, I’ve been writing almost every day for an hour a day. Sometimes less, sometimes more. Most of the time, I’m exhausted and not very motivated, but once I started writing, I really enjoy it and often keep going longer than intended. So here’s my advice to those of you who may be struggling to start your own novels: Don’t worry about motivation. Just block out some time, sit down, and start writing. You’ll be surprised what comes out. Here is the copyright information for Mr. Burkeman’s book, which you should all buy: “The Antidote: Happiness for People Who Can’t Stand Positive Thinking”, by Oliver Berkman. Copyright 2012 by Faber and Faber, Inc. Pages referenced: 66-69. Here is the map of the world I have created for my fantasy novel (Map of Daggers). 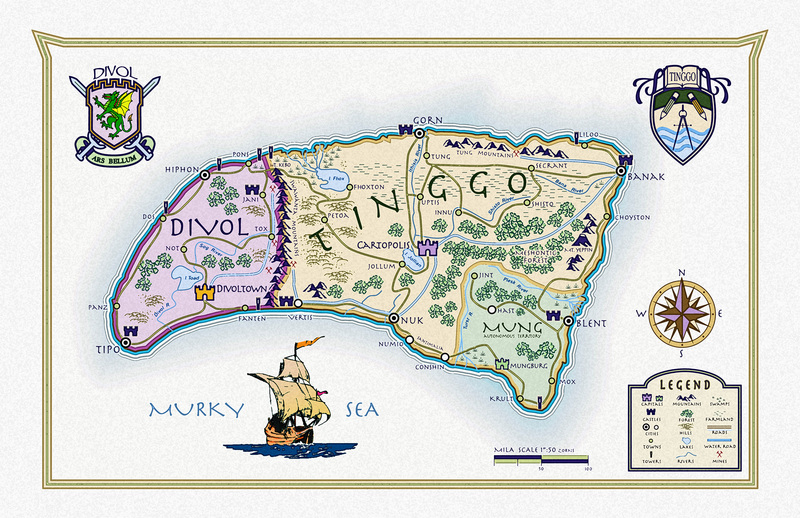 The whole known world consists of this island: Tinggo. Credit to Jordan Smith, my dad, for creating this from my sad, hand-drawn scribble. When I started working on this book, the map came first. I know what you’re thinking. It’s a little backward. Plus I’m going to have to go back and change things on the map as I write, because not every detail of the story has been worked out yet. Many of the city and town names will probably change, because I picked some of them at random. But as a writer, it helps to have at least a first draft of the map with you as you begin writing a fantasy novel. What’s the scale? How far apart are cities? How do people get around? I haven’t worked out an exact scale yet, although my dad indicates that 1 inch is 50 zorns (whatever that means). I’d say Tinggo is roughly the size of Ireland. It takes a few days to travel between major cities on foot, but people also ride zebras, which can be tamed here, unlike on Earth. I’m also toying with the idea of water roads, which function like canals that allow heavy cargo to be transported far distances quickly. What’s the climate like? Tinggo is a tropical or semi-tropical island. It seemed most fantasy novels took place in more temperate northern European climates, so I wanted to change things up. A tropical climate means no snow, the ability to farm year-round, occasional heavy rains, and several other things which will affect the story. Why are cities and towns placed where they are? I placed most cities by rivers or mountains. Otherwise, why would people settle there? However, a couple cities are in the middle of nowhere, and this needs to be explained. Perhaps a king wanted to encourage settlement in a remote area? Or a natural resource was discovered there? Or a lake dried up? All possibilites to consider. What are the political boundaries, and why did they form that way? Most political boundaries in the real world were formed by rivers or mountains or foreign powers meddling in other countries’ business. On Tinggo, the dominant power is the Kingdom of Tinggo. On the left is Divol, separated by mountains from the rest of the island. In the southeast is Mung, which is technically part of Tinggo but also an autonomous region, bordered on two sides by rivers. In the story, Divol declares war on Tinggo, and even though Divol is much smaller, its natural defenses give it a huge advantage. A brief word on names. Many of them were picked at random based on how they sounded. Some are similar to real world places. Santimalia, the pleasant beach region in the south, gets its name from Santorini. The capital of Tinggo, where most of the book’s early action takes place, is Cartopolis, meaning City of Maps. The name goes back to an origin story for the city itself which explains how maps became so important for their society. It’s something that will be explained in the backstory. Please feel free to leave a comment or question about the map. It’s still open for revision, and I’m happy to get feedback. Today we salute you, Muhammad Al-Idrisi, a cartographic rockstar from the 12th century. It remained the most accurate map of the world for the next three hundred years. The Tabula Rogeriana in all its glory. Just take a moment to really look at it. He uses an impeccable amount of detail, especially in naming cities and drawing the course of rivers. But this map is also a beautiful mess. The most accurate parts of the map are Northern Africa and the Iberian Peninsula, where Al-Idrisi lived and traveled. But look at the lands beyond Al-Idrisi’s vicinity, and things get hazier. England is completely misshapen. Norway looks like an island. Italy does look like a boot, albeit one which has sat out in the rain for a few days. The biggest problems come with the most far-flung areas of the world. Africa doesn’t go much beyond Ethiopia before morphing into a strip of land stretching the entire length of the map. The Indian subcontinent is smaller than Sri Lanka (called Taprobane at the time), and Japan doesn’t appear at all beyond China’s wavy coastline. 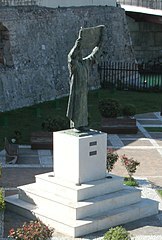 Nevertheless, Al-Idrisi is a rockstar when you consider the time period. Imagine the difficulties of trying to map such an extensive mass of land without the help of satellites, cameras, or a printing press, relying on conflicting reports from various sources around the world. But he succeeded, and with an impressive degree of accuracy. His map blows away any other world map made in Europe during this same time period. Most European maps squeezed the whole known world into a crowded circle that barely resembles our current image of the world. 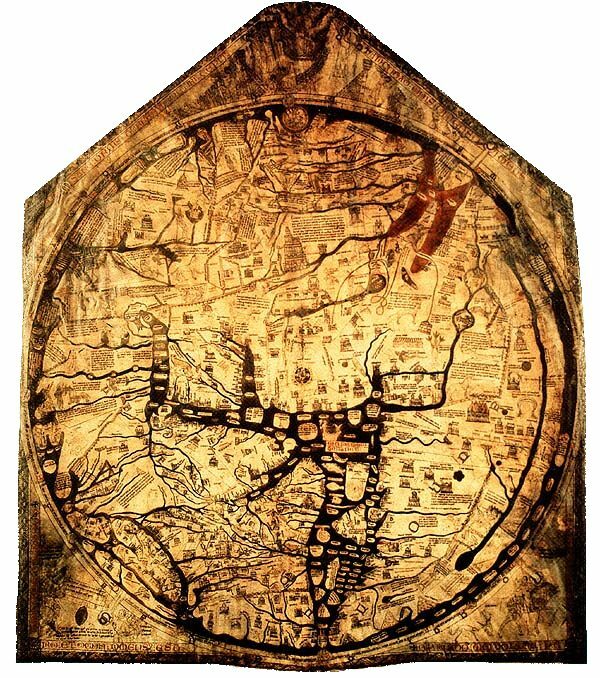 A typical one is the Hereford Map (made in England in 1285). Going from the Tabula Rogeriana to the Hereford Map is like going from Filet Mignon to White Castle. The Nile delta, for example, is ludicrously large. The Hereford Map. East is at the top, so turn your head sideways to read it. The Tabula succeeded because the author strove to be objective and faithful to the details. He didn’t place Jerusalem at the center (like the Hereford map) and try to fit in everything else around it. He used a wide range of geographical reports from other parts of the world to create the most extensive picture of the world that he possibly could. Sure, the lands at the edge of Al-Idrisi’s knowledge are fuzzy, inaccurate, and out of proportion. But to tell you truth, the fuzzy edges are my favorite part of old maps. We no longer really have them. They are a hint into what was unknown or elusive at that point in time. And they motivated us to go out, discover, and unfuzzy those lines. What does the cartographer do when the whole world is perfectly mapped and there are no more fuzzy edges? Is there nothing new for him to discover? Here’s what I think: There are always fuzzy edges. They’re just no longer on maps. My name is Petros, and I’m writing a book. But this, my friends, is not your typical writer’s blog. I created this blog as a space to showcase the things I find fascinating. Including, but not limited to, maps, history, fantasy, language, and yes, writing. If you are also interested in these things, then please join me! I will post every Sunday and Thursday. Let me say, first and foremost, that I have an inordinate love of maps. Old maps, new maps, hand drawn, computer generated. I can stare at a map for hours and just get lost in it. The exotic names of faraway cities, the irregular borders between countries that tell a story, and the evolution of landmasses from vague squiggles into their definite forms all fascinate me. When I was a kid, I wanted to be an explorer. I was disappointed to learn that I was born in the wrong century. It had all been discovered already. Sure, there was Outer Space. But that’s infinite, and rather bleak. What I craved was the thrill of coming upon an undiscovered island and exploring inside to see what secrets lay within. I began drawing maps of a fantasy world. A continent and then a whole planet, with political boundaries changing through the centuries and coastlines becoming more distinct. What must it be like to live in such a world that was still being fully discovered? Recently, I found these old maps while cleaning my bedroom. A flood of memories came back to me. I wanted to start creating a history for this world. For a while, I had felt that I was missing a creative outlet in my life, and this was just the spark I needed to let that energy out. So recently, I started writing a fantasy novel, and it takes place on an island in this made-up world. I’m loving it. Maybe I’ll get it published some day. Maybe I’ll self-pubish it as an ebook through Amazon. But for the moment, I’m not worried about that. I’m just enjoying the process as a welcome diversion from my day job. The main character of the book is Zinke, the Chief Mapmaker of the Kingdom. He is basically a rockstar in this world because the skill of cartography is very highly respected. People are very visual in this world. They don’t write messages to each other; they draw maps. Zinke’s job is create maps of the island, but when the neighboring Kingdom declares war, the King asks Zinke to join the army as their guide when they go into battle. Ultimately, the fate of the Kingdom all depends on Zinke’s highly specific cartographic knowledge. Meanwhile, there are magical weapons to defend against and a mysterious map with secrets that Zinke finds and tries to interpret. I might post snippets of my draft on the blog from time to time, so keep your eyes peeled. But the main purpose of the blog is about looking at interesting maps together and seeing what thoughts spring from there. Please follow me and drop me a comment. I’m also on Twitter @Petrosjordan.